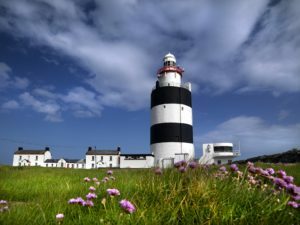 Hook Lighthouse is anything but modest as it lays claim to not only being Wexford’s most popular visitor attraction but also the oldest original operating lighthouse in the world. There is nothing I like more on a road trip than to sample the fayre and food of the locality and there are always interesting taverns and hostelries to explore. However, right up there on any camping experience has to be the al frescomoments, from ‘breakfast in bed’ to the unbeatable barbecue where you decide on your own menu and mealtime, always in a room with a view and where possible overlooking the sea. That’s dining out with a difference, Vanhalla style. There doesn’t have to be an occasion you just make an occasion of it. And while I do look on enviously sometimes at the fancy barbecue contraptions which are available I still prefer the flavour, fun and nothing added but time feel of the old school charcoal BBQ. I know that hunger is a great sauce, but somehow or other the time spent waiting for the charcoal embers to slow cook is for me the signature taste of summer and eating out, the camper heaven way. No matter how sunny, once you are cooking outdoors you need a long burning charcoal, to retain the heat and go the distance into the evening on a breezy coastline berth. I have found Nam Char, a Namibian hardwood charcoal to be the best by far. A close second in terms of importance at the BBQ is a chilled beverage of your choice. The campervan is worth every penny for the fridge alone, whether your tipple is a lemonade, craft beer blonde or a crispy Albarino. The fine forecast had us flocking back to Ferrybank Campsite, where it was a full house, so booking is advisable in this convenient, open-all-year-round site, such is its proximity to Wexford town, its ideal advantage as a staging post in the south east and proximity to Rosslare ferry port. The piece de resistance for this short sojourn was a visit to Hook Lighthouse, 47km away. There are an abundance of beaches and other amenities and attractions of interest all over Wexford and the south east but I have a thing about lighthouses. Ironically, Hook lighthouse designed and determined to be seen at all times at all cost, as its cause d’etre, is a winner of Ireland’s favourite ‘Hidden Gems’ tourism awards. Today like so many of our lighthouses it is enjoying a new lease of life, shining a light on our heritage and maritime history, the light keeper’s house converted into a tourist facility basking in the Wexford sunshine in all its splendour, standing tall above the craggy rocks. While unmanned now, the 800 year old Hook Lighthouse isn’t holding it light under a bush or anything as it lays claim to being the oldest original operating lighthouse in the world no less, and to being the most popular visitor attraction in County Wexford for good measure. Guided tours are available or you can stroll around and soak up the atmosphere and scenery at your own pace. There is a visitor centre with a café and gift shop but also plenty of scope and space to picnic in a safe family-friendly environment. Festivals and other events are regularly staged at the site, so watch out for those. Check out hookheritage.ie for more info. The spacious car-park is accessible to campervans, the gates close in the evening at 6pm. There is also ample wild camping/parking space outside the perimeter walls along the coastline, but beware of hazards such as blow holes and rough seas. Back at Ferrybank the barbecues were blazing away amid a great mix of vehicles, the majority of them from GB, Germany, France, and Switzerland, Netherlands and Austria as well as a good cross section of Irish. On my second visit to the Ferrbybank facility the staff were spot on as before. The fee per night was €27 (€4 of which is for electricity) and there’s a further €2 for showers. I couldn’t help wondering though when the recreation/community room currently under renovation is going to come back into use and for me the chemical toilet disposal sluice beside the wash-up sinks could be better located. The campsite itself couldn’t be better situated though and it’s a perfect base for touring the sunny south east and exploring Wexford.